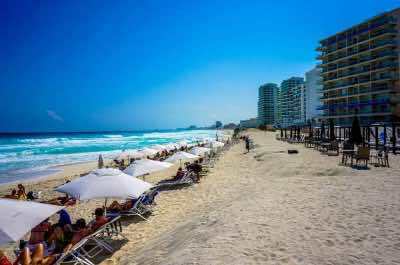 Here are our recommended Cancun beaches! 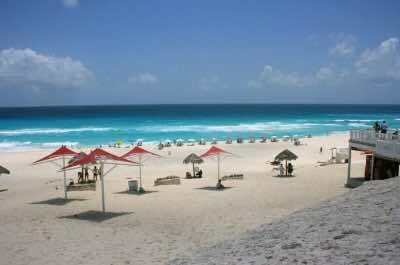 Cancun offers some of the best beaches in the world and you need to explore them all. Most of the beaches are located along the Hotel Zone and are easily accessible by walking, car or taxi. Take your choice from beaches with ocean waves to secluded beaches with calm waters. Enjoy organized entertainment and all night pool parties or skip the crowds and head to a quiet beach where you can relax and rejuvenate your soul. Sports lovers can snorkel, jet ski and you can end your day having dinner at an amazing revolving restaurant, high up in the sky with panoramic views over the city and the coastline. Looking for a quiet Cancun beach? 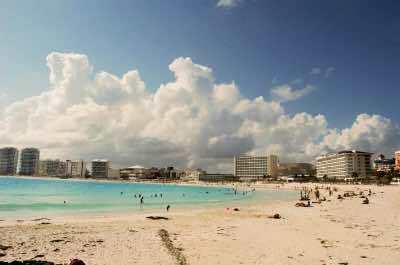 Head down to the southern end of the Hotel Zone and you will find the lovely Playa Delfines. This beach is one of the few with a public car park so you can drive down in your rented car and park with no trouble. The sand here is darker and courser than the other beaches and the water has waves great for surfing and bodyboarding. When you arrive you will be charmed by the large colorful sign that reads 'Cancun' in huge three-dimensional letters, each one almost the height of a person! Make sure you get some photos. Relax under the little thatch huts and admire the stunning views. Then have a swim to cool off. Take note of the signs regarding the water conditions, there are sometimes strong undertows. If you have a head for heights, take a trip with the Skyrider Parasailing company. When you are done, you can explore the interesting Maya Ruins that are nearby. 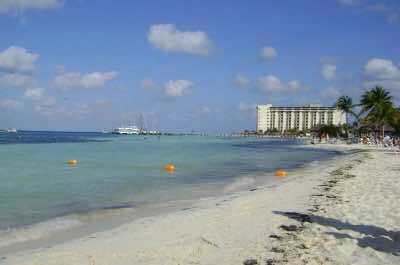 Playa Chac Mool is located on the northern end of the famous boulevard close to the main hotels. It gets its name from the famous Columbian stone statue of a mysterious figure in a reclining position holding a bowl on its stomach. This Cancun beach is extremely popular with both locals and tourists and offers clean white sand and stunning turquoise waters. Because it faces the open ocean, waves are found and are perfect for surfers. Swimming is great if there is not too much wind, but take note of the naturally occurring currents. Enjoy a walk along the shore, the north side offers a rocky section with interesting rock pools and shells to collect. Then relax on the beach and soak up the sun. A fabulous restaurant and bar called Senor Frogs is over the road and is a buzzing venue where you can chill out and enjoy an exotic drink with a plate of traditional nachos and quesadillas. When you are done, stroll through the local market and be awed at the magnificent Mexican hand crafts. Buy a sombrero to take home! If you are looking for the best all-round Cancun beach for swimming, diving and local entertainment, Playa Tortugas, or Turtle Beach, is the beach to visit. 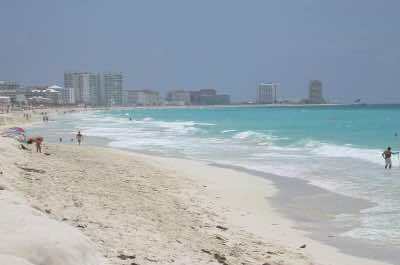 It is located about 5 miles from downtown Cancun and is easily reached by taxi or bus. The beach is open at all hours and there is no entrance fee. Be prepared for a fun and festive atmosphere with locals and tourists soaking up the sun, swimming, playing volleyball and jumping off the long pier to show-off! The water is shallow and warm, ideal for families with kids or for elderly people. Lovers of water sports can explore the beautiful marine life while snorkling close to the shore or venture further out to the Great Mesoamerican Coral Reef for some serious diving. The brave few can try some bungee jumping from the tower, admire the amazing views before taking the plunge! The not-so-brave can just relax on a deckchair under an umbrella, sip a cocktail and admire the fabulous views from the ground. You do not need to go far to find the next stunning Cancun beach. Playa Caracol is located in the main Hotel Zone near to the Caracol Mall. This beach offers clean white sand and azure warm waters. There are some waves and the water can get choppy, so it is great for bodyboarders and swimming is fine but stay close to the shore if you are not a strong swimmer. Rent a lounger and umbrella and relax on the sand, sip a refreshing drink and enjoy the scenery. This is the launching point for trips to Contoy Island so you can enjoy watching the boats come and go or you can decide to join a trip too. Close to the beach is the famous Hotel and Spa. Treat yourself to a rejuvenating stone massage or a soak in an outdoor hot tub. If you want to stay over, the rooms are beautifully appointed with elegant dŽcor and offer private balconies with a pool or sea view. Located in main Hotel Zone, our next recommended Cancun beach is Playa Marlin. This beach faces the open ocean and offers fairly rough waters, so it is not ideal for swimming but is perfect for watersports like sail boarding and surfing. It is easy to reach by walking or driving down from the hotels. You can park in the nearby street and take the sandy path down to the beach. This is a huge beach with beautiful sugar-white sand and is never over crowded. Take a walk and enjoy the wide open spaces and stunning ocean vistas. Then settle down in the shade under an umbrella or get a Caribbean tan in the sun! Mobile vendors offer food and drinks and there are also many bars and restaurants nearby if you go back up to the main road. Get romantic in a different way - this beach faces east and offers the most amazing sunrises. Get up early, pack a breakfast picnic basket and watch the sun rise over this Caribbean paradise. Designed for pampering with an adult vibe, this famous Cancun beach is known for its rows of iconic white beach umbrellas under which you will find beautiful people! Relaxing on the white, powdery soft sand and soaking up the sun is a must. Instant service is top class with excellent food and drink being prepared and offered by waiters. The food is delivered in special takeaway boxes that can be sealed up and left on the beach while you take a quick dip in the Caribbean waters and show off your designer beach wear. The cocktails are loaded with alcohol so beware, or not, depending on your mood! During the day, if you find the energy, you can play a game of beach volleyball or take a lesson on how to surf. From late afternoon until the sun rises, the beach rocks with beach parties, live music, fun and dance. Close to the hotels and easy to access, this is a beach with all the entertainment amenities you need. Photo by BORIS G on Flickr. Located in the center of the north end of Hotel Zone, near to the Casa Maya Hotel, Playa Langosta, Lobster Beach, is the perfect Cancun beach for swimming. It faces the Bah’a de Mujeres and the waters are warm, calm and shallow, ideal for kids, the elderly, snorklers and swimmers. Beautiful coral sand makes for the perfect setting to relax and soak up the sun. The beach also has a great center for watersports, so you can take a few lessons or rent equipment for surfing, snorkling or diving. After your swim take a walk to the Dock to watch the cruise ships and ferries docking and the passengers disembarking. Then head for La Cueva, the Cove Restaurant, which features a fabulous, well priced buffet and many seafood dishes. Like many of the beaches in this area, public restrooms are scarce, so plan accordingly if you are going to spend a day here. Calling all party animals! Head off to the one and only 24 hour party Cancun beach - Mandala Beach. This is the official beach club of two of the most popular nightclubs - The City and Mandala. It is also one of the few beach clubs that is open to the public in the Hotel Zone and is centrally situated and easy to find. Put on your designer swim gear and settle down on a lounger, select an exotic cocktail from a passing waiter and enjoy the view and the people watching. During the day, you can swim in the lovely clear blue waters and relax on the sand, at night this is a pool party of note with fabulous music and drinks flowing. Fashion shows, bikini competitions, foam parties and live concerts are part of the entertainment in this hip and happening venue. It also makes a great wedding venue if you are considering tying the knot any time soon. Located at the northern end of the Bay is one of the most beautiful Cancun beaches - Playa Gaviota Azul, Blue Seagull Beach. This picture-perfect setting offers endless powdery white sand, turquoise waters with some waves and loads of Caribbean sun. It is near to the famous Coco Bongo and access is from there or from the small car park on the north side. The beach is busy but you can rent a lounger and umbrella and settle down to watch the people and the view! Do some snorkling, swim and take a walk to explore the rocky section at the end of the beach. During windy season, the waves get extremely big, attracting surfers who come to try out their skills. Entertainment, restaurants and beach bars are readily found, making this a perfect day outing with all the amenities you need. A beach with a fabulous rotating scenic tower is the next Cancun beach to visit. 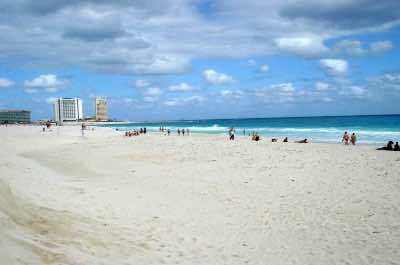 Playa Linda is located 3 miles from downtown Cancun and is easily reached by car or taxi. This beach is a favorite with the locals and bargaining is rife when the fishing boats arrive with their fresh catches of fish at the Marina. Playa Linda is situated at the meeting point of the sea and lagoon. It is very busy with boats, ferries and charters so it is not always the most ideal beach for swimming. If you want to get into the water, rent a jet ski or a kayak. Walk along the beach, chat to the locals and enjoy the stunning vistas over the turquoise waters. Then head up to La Torre Cancun, a revolving tower that offers fabulous views over the city of Cancun and the coastline. 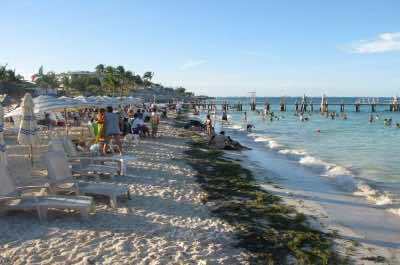 Then head to El Embarcadero, the bustling Marina precinct and join a tour to swim with the dolphins or take a ferry to the beautiful Isla Mujeres.